Droid4x, a well-known game platform, has recently released an Android simulator for Mac, becoming China's first Android simulator available to download for free on Mac. With it, game players will be able to play popular mobile games for the first time and experience a good deal of Android apps while obtaining free access to various other software or resources. Droid4x supports Android games and apps on computers while breaking limitations of the mobile phone screen size. It also provides and fully enhances players' visual and control experience in games. It is the first of its kind that supports multi-point touch. 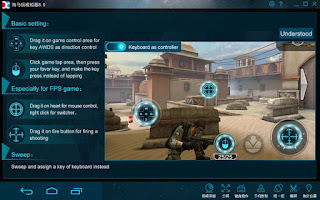 Droid4x simulator for Mac exclusively and perfectly transplants the multi-point control function of the mobile phone to the keyboard. Users only need to install Droid4x on their Mac to enjoy Android games. In addition, users can manage all of their gaming needs by using the keyboard or mouse. They will be able to stage attacks in diagonal moves, and define front sight, shooting buttons and shortcuts in games. As China's only vendor with core kernel technology, Droid4x has independently developed kernels that support both Windows and Mac OS, and provides almost all Android apps and games. It has broken through technical barriers by providing foreign games, and creates more possibilities for players. In addition, Droid4x is far superior to its peers in performance, compatibility and controllability. Through hardware virtualization, Droid4x eradicates game plug-ins without modifying game packs, thereby protecting the interest of game developers and players' game property. With equivalent hardware, Droid4x' overall performance is over 50% superior to its peers. Thanks to its outstanding quality, it can be considered one of the simulators with the best experience so far. 0 comments on "Droid4x is China's first Android simulator available to download for free on Mac"